Manila Water Co. on Tuesday offered to waive the bills of customers who suffered seven or more waterless days in March, but the state regulator said the company is not off the hook yet for widespread service interruptions in Metro Manila’s east zone. 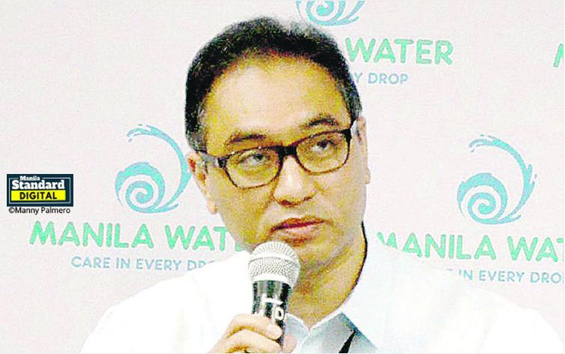 At a news conference, Fernando dela Cruz, Manila Water president, apologized again to their customers for the widespread water service interruptions and offered a one-time reduction in water bills. “We understand the profound frustration that our customers have expressed. And we sincerely apologize for the widespread inconvenience that we have caused all our customers in the east zone concession area with this unprecedented water shortage that began on March 6, which is beyond the typical service interruption,” he said. “All customers will have their minimum charge waived, while...customers in barangays which experienced absolutely no water service for at least seven days continuous or broken days within March 6 to 31 will not be charged for their March bills,” Dela Cruz said. The minimum charge covers 10 cubic meters of water, as well as environmental and sewer charges. Dela Cruz said lifeline customers will benefit the most since their minimum charge, which is also their monthly charge, will be both waived. The waiver will be reflected in their April bills. De La Cruz assured customers that technical solutions are being put in place to help stabilize the water supply distribution across the east zone. “As of March 25, our eight- to 12-hour water availability at ground floor level has reached 97 percent. From a high of 61 severely affected barangays, we are now down to eight barangays which are dependent on interim network solutions, static tanks or water tankers,” he said. “Manila Water remains hard at work to bring back 24/7 water service to all its customers even at reduced pressure. We continue to work with the MWSS-Regulatory Office and Corporate Office in addressing this situation in accordance with the directive of our good President,” he added. Metropolitan Waterworks and Sewerage System Administrator Reynaldo Velasco, however, said they have yet to study what penalties they will impose on Manila Water, one of two private concessionaires. “There are other penalties under the concession agreement that they will have to face,” Velasco said during a press conference. Bayan Muna Party-list Rep. Carlos Zarate said the Ayala-led Manila Water should be held accountable for the water shortage in Metro Manila and Rizal province. Zarate, one of the petitioners against Manila Water, said the waiver was not enough. Zarate said aside from the bill waiver, Manila Water should, among others, also compensate the damage they caused the consumers and be ordered to stop collecting the rate increase allowed last year by the MWSS. “We will continue to seek accountability from Manila Water and MWSS for this catastrophic, greed-induced problem,” Zarate said. “This is certainly a big victory for consumers. But we must not stop here. There is more that needs to be done in order to prevent this crisis from happening again,” Hontiveros said. Also on Tuesday, Velasco denied any under-the-table deals in the Chinese-funded Kaliwa Dam project, which is expected to meet Metro Manila’s growing demand for water. He said speculation was fueled by Global Utility Development Corp. chief executive officer and director Toshikazu Nomura’s statement that the China-funded dam will cost $800 million, way higher than the government figure of $248 million.